Haven’t heard of Corner Creek? Neither had I until I came across it on sale for $29 at my local spirit store. With an attractive bottle and a reasonable price, I decided to take this 88-proof bourbon for a spin. Further information on the brand wasn’t easy to find, but eventually I was able to determine that Corner Creek is made by an elusive Bardstown, Kentucky, outfit called Kentucky Bourbon Distillers Ltd. Some of the other bourbons they make include Jefferson’s Reserve, Noah’s Mill, Rowan’s Creek, Pure Kentucky, and Kentucky Vintage. But enough of the background. The bourbon, which uses wheat and rye, in addition to the required corn, is ultimately what I was interested in. It’s a slightly hazy amber color with an inviting nose of vanilla, toffee, and cherry notes. Once I tasted Corner Creek I found nut, rye, and lots of oak. Dryness is the most pervasive element to the flavor profile and that continues in the finish, which includes some pine. You can definitively taste the rye in the blend. Ultimately, it’s a good bourbon but not great, at least if you plan on drinking it straight or on the rocks. I don’t plan to buy more soon, though I don’t regret my impulse purchase. Given the dominant rye flavors, I think it would be an excellent component for a Manhattan. 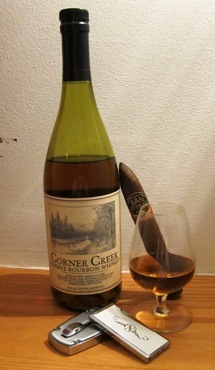 As for cigars, the Corner Creek Reserve Bourbon is pretty versatile. Both a mild Connecticut cigar and a full-bodied Nicaraguan smoke went well.